Warehouse full of assistive technology equipment. To search for used equipment from many reuse programs throughout California, visit the AT Exchange website. If your local program is not represented in the AT Exchange, please contact one of the organizations listed below. The following agencies accept donations of gently used assistive technology devices and gadgets that are cleaned and repaired before donating or providing at a low cost to people with disabilities. The greater LA chapter of the ALS Association has a "loan closet" for clients who are registered with them. When you register with The Greater Los Angeles Chapter, their case managers help you obtain the services and equipment you need. The Dayle McIntosh Center's reuse program serves consumers of all ages and disabilities that live in Orange County. We are part of both State and County reuse collaborative which bring together equipment vendors, non-profit agencies and specialists to find appropriate equipment for consumers. We take donations of used AT/DME and then repair, adjust and sanitize items in preparation for reuse. 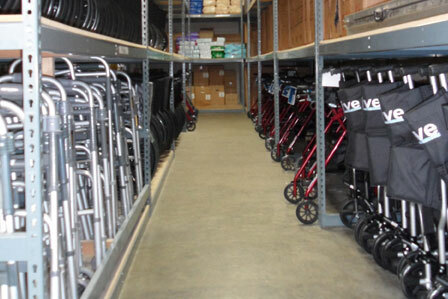 Inventory can change constantly but some items include; wheelchairs, walkers, canes, crutches, shower chairs, commode chairs, Hoyer lifts and many other items. The goal is to help consumers get equipment when their natural supports fall short. The Repair and Re-Use Program of Independent Living Center of Kern County is a loan and recycle program that empowers people with disabilities by making wheelchairs and other assistive equipment available so that they can live independently. ILCKC collaborates with a local medical equipment company to repair and regenerate assistive technology items (such as wheelchairs, lifts, and walkers). Loaning equipment (indefinitely and without fees) helps fill the gap while people wait for repairs, payment programs, order equipment, etc. Disability Action Centers durable medical equipment recycling program serves consumers of all ages and disabilities that live in Shasta, Modoc, Siskiyou, Lassen, Butte, Tehama, Glenn, and Plumas County. We take donations of used AT/DME and then clean, repair and distribute the devices to people in our communities who need them free. Our inventory may include; wheelchairs, walkers, canes, crutches, shower chairs, commode chairs, Hoyer lifts and many other items. Inland Hospice Association direct program services are available to persons in the following Eastern Los Angeles County and Western San Bernardino County communities: Pomona, Ontario, Montclair, La Verne, San Dimas, Glendora, Guasti, Diamond Bar, Walnut, Claremont, Chino, Chino Hills, Alta Loma, Upland and Rancho Cucamonga. In addition to direct services to patients in these communities, the Inland Hospice Association makes available the free use of medical equipment to a much larger geographical area through our Home/Healthcare Equipment Loan Program, one of only two such programs operating in Southern California. The ILRSCC Reuse program is designed for seniors and people with disabilities who are in need of assistive devices and cannot obtain them on their own. With the Reuse program, the ILRSCC will make the effort to provide assistive devices to those individuals who are in need of them. The center is open Monday through Friday from 8:30 AM to 4:30 PM PST. ILRSCC accepts devices donated by any organization or private individuals. The devices could be manual wheelchairs, power wheelchairs, walkers, etc. ILRSCC will make sure the donated devices are in good condition by making necessary repairs to them. The Center will then donate the devices for free to low income seniors or people with disabilities within the community. Through the Reuse program, The ILRSCC is committed to empowering persons with disabilities to control their own lives and to live independently. SCRS is an Independent Living Center (non-residential). We provide services and advocacy for persons with disabilities. SCRS has been a private, non-profit organization since 1979. SCRS loans assistive technology devices; e.g. wheelchairs, walkers, crutches, canes, portable commodes, transfer benches, sliding boards, etc. We loan equipment at no cost. SCRS will also accept any donations of assistive technology devices that are in good working order. Repair & Share Program is a loan and recycle program that will enable people with disabilities who are in need of power wheelchairs to live independently. Resources for Independence is collaborating with G7 Medical Services, a local supplier of medical equipment, to repair power wheelchairs donated to their agency. These chairs will be used to aid people with disabilities, maximizing their independence by loaning the chairs on a temporary basis while they find the means of getting a power wheelchair of their own. FREED provides assistive devices through its Reuse Program on a permanent or loan basis. Availability varies and may include: mobility devices such as wheelchairs, walkers, crutches and canes; Bath aids such as transfer benches, shower chairs and stools; Toilet aids such as bedside commodes and raised toilet seats; Hospital beds, patient lifts and more. FREED accepts donations of such items in a clean and serviceable condition. FREED may be able to provide transportation but supplying your own delivery is much appreciated. The PC Community Clubhouse provides a variety of services to its members including: repairing and refurbishing personal computers, teaching members to build a computer from scratch, teaching members to install hardware and software, teaching members to format hard drives, and teaching members to prepare computers for donations to others. The AT Reuse Program is intended to support increased reassignment of used devices to new individuals who can benefit from the devices. Under the AT Reuse Capacity Building Grant, CALIF reassigns assistive technology devices including durable medical equipment, communication devices, vision products, hearing products, mobility products or other assistive devices. The Able People Foundation's private ads help people to sell or donate their used assistive products for free. Through their Giving Program, they identify and give the products to people with no insurance or funding that are desperately in need through an application process, and collaborate with other organizations and businesses to identify low income elderly, and individuals living with physical limitations in need of basic products not covered by their health insurance. They also will purchase the products and distribute in larger quantities. CompuTech for Humanity (CFH) is a nonprofit organization that is dedicated to charitable and educational purposes. CFH boasts a multi-cultural group of volunteers that include individuals with various disabilities. CompuTech for Humanity was founded to bring computer technology access to low-income handicapped individuals and low-income family with children. CompuTech for Humanity also delivers education supplies and refurbished computers to developing nations to promote literacy and interest in learning. They give old computers new life by placing refurbished products with non-profit organizations, schools, libraries, victims of fire and tragedy, and low-income and disabled households. Our volunteer technicians produce computers every week from your donations, to help organizations and families that would not otherwise have the means to obtain this technology. Ewaste is a non-profit that accepts donations of household electronics and computer for recycling. They also give away refurbished computers to schools, non-profit organizations and economically and/or physically disadvantaged individuals. Our electronics and computer recycling efforts support our training program, where volunteers learn to reclaim, refurbish, and restore computers for home, school, and office applications. ReCares, formally known as Home Cares is a program that collects gently used medical equipment and unused health care supplies. Some items are always available such as gait belts, pill boxes, commodes and standard front wheel walkers. They also receive daily requests for wheelchairs, walkers with seats, canes and liquid nutritional supplements. Hours vary by location: Oakland Thursdays 12pm-4pm, San Francisco 10am-3pm, and Marin Wednesdays 11am-2pm. CAS provides services to residents in Pasadena and its neighboring communities through the free loan of wheelchairs and other medical equipment for in-home use. Riverside Community Access Center has an equipment reuse program that will take donation of wheelchairs, ramps, rollators/walkers, hearing aids, hospital beds, suction safety grips. They also have senior low vision program that will accept donations of visual aids. Easter Seals Superior CA loans medical equipment such as commodes, shower seats, crutches, walkers, and wheelchairs to assist individuals after surgery. Individuals can use equipment indefinitely with no fees. Serving 13 counties: Alpine, Amador, Calaveras, El Dorado, Nevada, Placer, Sacramento, San Joaquin, Stanislaus, Tuolumne, Yolo, and Yuba. SVILC accepts manual wheelchairs if they are 5 years or less and in good condition. Physical Therapy For All (PTFORALL.org) helps financially challenged individuals by funding part or all of their physical therapy visits and helps clinics and other nonprofit organizations providing services to those with economic struggles by donating used physical therapy equipment, healthcare related supplies and assistive devices (wheelchairs, walkers, crutches, braces, canes, etc.) free of charge. The majority of our rehabilitation equipment is donated to nonprofit organizations in Orange County and San Diego County. Much of this equipment continues to be reused and passed along, keeping it out of landfills. CID accepts donated AT and gives it to consumers in need of the equipment. CID accepts a variety of durable medical equipment such as stairlifts, porchlifts, elevators, wheelchairs, electric wheelchairs and scooters, walkers, canes and crutches, hospital beds, hearing aids, visual aids such as magnifiers, etc. Items must be in excellent working condition and be “like new” to be accepted. CID serves disabled residents of San Mateo County. Most items are provided free of charge but in certain instances there may be a share of cost. CID accepts donations by appointment only. Please call formore details. Renew Computers, founded in 1988, is the largest independent electronics recycling company in Marin County, California. They have a warehouse facility and service center centrally located near downtown San Rafael where computers are collected, sorted, and properly recycled. Computers are received on a daily basis from individuals, small businesses, and large corporations. They offer low-cost refurbished laptop and desktop computers; and offer low-cost repairs and parts. The equipment loan and reuse program provides trial of various types of assistive technology equipment and software so that individuals with disabilities have an opportunity to test a particular device or program prior to purchase or at times when equipment is being repaired or unavailable. The reuse component of this program includes various pieces of equipment for exchange, sale or free of charge. ATEC accepts donations for reuse, please inquire before donating. The Sonoma County Section on Aging operates a small reuse program in conjunction with Careful Moving & Storage. Equipment varies on a regular basis. It is requested that people come down to see what equipment is available at any given time. Hours: 10am to 3pm Monday - Friday. A.C.E.S., a California Public Benefit Non-Profit Corporation and a 501(c)3, originally established in 1995, is a volunteer-driven organization refurbishing donated computer equipment and software for distribution to low-income San Diegans with disabilities and Seniors. The Durable Medical Equipment Aid Society provides DME on a loan basis to those individuals living in Los Angeles County who lack the financial resources or insurance coverage to access in-home DME for their rehabilitation or recovery from illness or injury. There is a small administrative fee, which varies depending on the type of equipment loaned. The administrative fee covers delivery of equipment. Availability of DME varies, but we have wheelchairs, walkers, crutches, canes, transfer benches, shower chairs, portable commodes, in-home hospital beds, etc. We accept donations of such items that are in clean and serviceable condition. Visual Aid Services accept used Vision Products, refurbish them, and provide them at a reduced price to individuals who are on fixed or low income budgets, but who need the vision equipment.